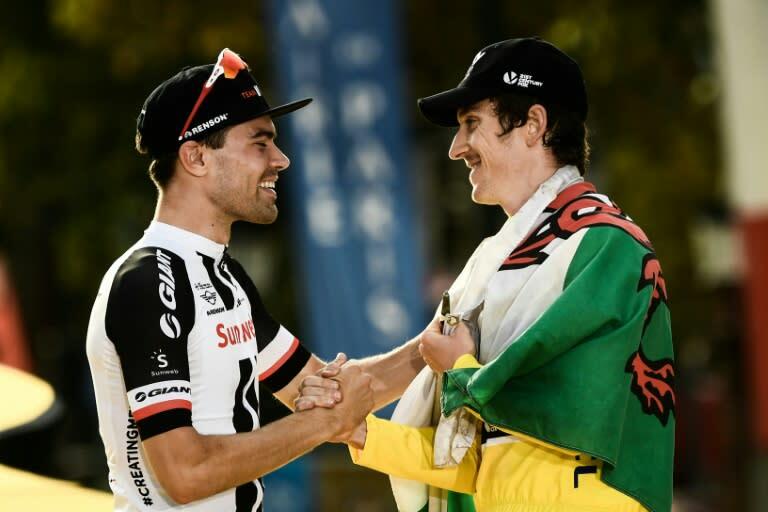 Tour de France winner Geraint Thomas and this year's runner-up Tom Dumoulin renew their rivalry when the Tour of Germany resumes on Thursday after a 10-year hiatus. Having opted to skip the three-week-long Vuelta a Espana, which starts Saturday, in favour of the revamped four-day Tour of Germany, Thomas and Dumoulin will be chasing each other again over 737.5 kilometres in Germany as the Welshman makes his first appearance since the stunning Tour victory last month. ASO, the organisers of the "Deutschland Tour", who are also behind the Tour de France, hope the revamped race, which starts with a 132-strong field and finishes in Stuttgart on Sunday, will boost cycling's profile in Germany. A lack of sponsors and media support led to the race being scrapped in 2009 after a series of high-profile doping cases tarnished the sport's image. Back with a shortened format -- the race used to be held over nine stages -- it is hoped the Tour of Germany will enjoy a successful return and become a UCI World Tour event as a nine-day race. "It is obviously great to see the return of a Tour of Germany," said German sprinter Marcel Kittel, one of the favourites to win the first stage from Koblenz to Bonn over 157 km. "It is in itself an important sign for us German riders -- it's great to be at the start." Organisers hope having Thomas (Team Sky) and Dumoulin (Team Sunweb) on board can boost the race's profile after a lengthy absence. "It simply can't be the case that Germany does not have its Tour -- we need this platform to continue to develop cycling," says race director Claude Rach. "The field is really very strong, it is above what you could expect, but we will start modestly and do not want a three-week race. "We start on a healthy basis and want to develop it, if possible." The second stage, from Bonn to Trier on Friday, will test the riders with four climbs, the first of which comes at the 129-km mark of the 196km course. While the high-profile Tour de France has cities queueing up to host stages, it was not the case over the border in Germany. Several municipalities turned down ASO when approached about hosting a stage. It is a throwback to the disenchantment of 2007, when state broadcaster ARD abruptly stopped televising the Tour de France, only to return in 2012. However, last year ASO proved they can host a stage in Germany when the 2017 Tour de France began in Duesseldorf, won ironically by Thomas, who took the individual time trial. "It's going to be great," said the Welshman.